We made a video explaining what minimum viable product in mobile app development process is. Check it out! Judging from our experience, entrepreneurs interested in developing an app, that is a copy of the already existing product, is a rare case. Most often, entrepreneurs and business people, startups and executives of all levels are looking into developing an absolutely unique product. Most likely, this product is going to be a bit similar to the one of the competitors, but it is bound to have special features highly appreciated by the end customers. There are two main factors that influence the whole process of product development. Firstly, it is up to the product owner to create unique features that will make the result competitive and attractive for the customers. Second factor is time. Let’s imagine that you and another entrepreneur have come up with one and the same idea at the same time. Obviously you want to implement this idea faster than your competitor, so as to be the first to offer the product to the end user. The two main things an entrepreneur would like to do is to develop a product with unique features and to do it as soon as possible. But what if the product you pinned so many hopes on failed to meet the demands of the user? As sad as it sounds you will have to face it: all those dollars and months you spent on the product development end up being wasted! What would you say if somebody offered you a chance to find out early whether the user likes your product? All it takes is less time and a significantly smaller amount of money. What it brings is an early product release with a bright perspective to make it tasty eventually. Sounds interesting, right? Switching to the language of entrepreneurs, minimum viable product (MVP) in app development is a possibility to test the demand on your product on the market with minimum investment in the development and in the shortest time. An example of how this all may look like. You have 230 000 $ as your product budget and you are going to spend 7 months on its development. After 7 months your product is launched. You get user feedbacks and see whether they like it or not, what exactly makes them particularly happy and what, on the contrary, doesn’t seem to be working the way you want it. Now let’s imagine that you spent only 15 000 $ and launched the first version of the product in 6 weeks. Surely, this version doesn’t include a full list of the ideas you intend to implement. However, it includes a few most attractive features that differ your solution from what is already there. When 6 weeks are over you get positive or negative feedbacks about those features. So do you think it’s better to get the feedback sooner or later? If you ask me, I would prefer to do the market testing earlier, just like most of our clients do. Do you want to test the idea with minimum investment? – Build MVP. Do you want to test the idea in the shortest time? - Build Minimum Viable Product. 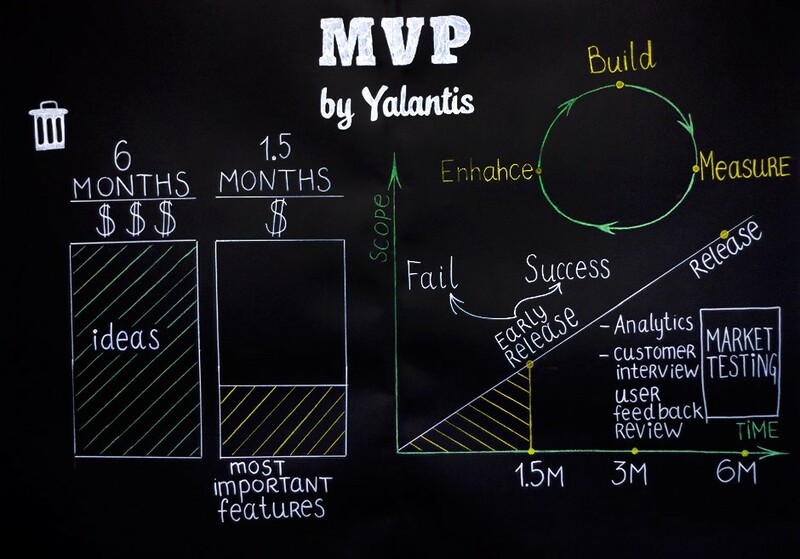 Today minimum viable product development perfectly fits the basic principles of Lean Startup which you can learn more about here.